It took me a few days to recover, and to be honest I still have some cough and my nose is still...ugh. But I managed to get a game last night in Dreamers Vault! YAY! 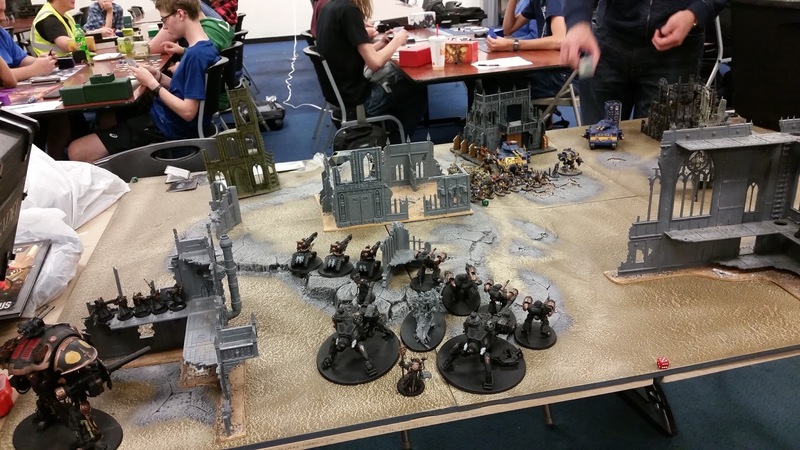 This time I had the privilege of playing against the Thousand Sons, and feeling better than on Saturday, I was able to make better use of my Mars Adeptus Mechanicus army (okay, they're Draconis IV, but they play like Mars). 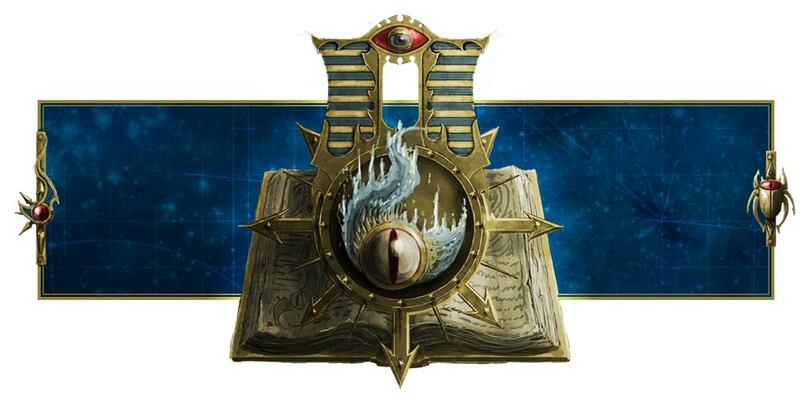 So what did the Thousand Sons bring? They brought a Battalion Detachment and a Vanguard Detachment to net them 7 Command Points. He brought Ahriman, who is his Warlord, an Exalted Sorcerer, a Sorcerer in Terminator Armor, 2 squads of Cultists, a squad of Rubric Marines, a Daemon Prince with no wings, 2 Hellbrutes, 2 Chaos Predators and a squad of 10 Scarab Occult Terminators with a heavy warpflamer and 2 Hellfyre Missile Racks. Scary. Well, he didn't bring Magnus so I guess it wasn't as scary as I thought it would be. Against the Thousand Sons I brought a Mars Battalion Detachment and a Spearhead Detachment, along with a single Knight Paladin. So I brought Belisarius Cawl, a Tech-priest Dominus, a Tech-priest Enginseer (still have to proxy him with my Cybernetica Datasmith because the one I ordered at my local gaming store has yet to arrive), 3 Kataphron Destroyers, a squad of 5 Skitarii Vanguard with 2 plasma calivers, a squad of 5 Skitarii Rangers with 2 arc rifles, 4 Kastelan Robots, 2 Onager Dunecrawlers with neutron lasers. I fitted my Knight Paladin with twin Icarus autocannons. We played open war, and the objective was Courier. That means, we select one of our units to be the Courier, but he cannot be our Warlord. Whoever kills the opponent's selected unit first wins the game. The twist was that units don't take morale tests. And the deployment was some weird triangle thing where my opponent had a red upright triangle from end to end as his deployment zone while my guys had to be split between two green triangles. I finished deploying first and chose to go first, and my opponent failed to seize the Initiative. For his Courier, my opponent chose his Exalted Sorcerer. As for me, I picked my Knight Paladin because of his 24 Wounds, and I deployed him way at the back, right at the corner of my deployment zone, bubble-wrapped by my Skitarii Vanguard, Onager Dunecrawlers, Tech-priests, and Kastelan Robots. Turn 1 was brutal for my opponent. I rolled 2 Canticles and got Shroudpsalm and the Litancy of the Electromancer. I didn't move anybody except the Skitarii Rangers to get them within range of their enemies, but they only killed 1 or 2 Cultists with their galvanic rifles and arc rifles. My Onager Dunecrawlers also killed another 1 or 2 Cultists with their cognis heavy stubbers, and put about 8 wounds on a Chaos Predator. Good thing the rolls of 1s and 2s count as 3, or it would only have been 6. Ugh. My Kataphron Destroyers supercharged their plasma culverins, and despite Belisarius giving them re-rolls I still ended up with one roll of 1, and 1 died. But in return I blew up a Hellbrute. Phew! I then used the Protocols Stratagem and changed the Kastelan Robots into Protector Protocols, and went to town with them. My first Kastelan Robot mowed down the wounded squad of Cultists, and the next 2 overkilled - only one of them was enough to completely eliminate the second squad of Cultists. The final Kastelan Robot shot the Rubric Marines, but I only killed 1 or 2, I think, because my opponent made most of his 3+ saves. My Knight then opened fire and while he didn't do anything with his heavy stubbers, his twin Icarus autocannons hit 3 of them and pulverized them to dust, leaving just the Aspiring Sorcerer as the sole survivor of that squad. His rapid-fire battle cannon then pummeled and destroyed the wounded Chaos Predator. In just one turn I basically took out all his troops and half of his vehicles. Half of his army was gone. That was just brutal. My opponent then proceeded to Deep Strike his Scarab Occult Terminators and Sorcerer in Terminator Armor right in front of my Kastelan Robots and moved all the survivors (Ahriman, Exalted Sorcerer, Helbrute, Aspiring Sorcerer) except the Chaos Predator forward, especially the Daemon Prince. He shot one of my Kastelan Robots to death with his Scarab Occult Terminators, combined with Smite, and put another 2 wounds on a 2nd with his Chaos Predator and stuff. His Hellbrute opened up with twin heavy bolters and I passed whatever saves I had for my Kastelan Robots. Oh, the Repulsor Grid came into effect and one of the Scarab Occult Terminators took a mortal wound when I rolled a 6 for his invulnerable save. Heh. He then charged with his Daemon Prince and Scarab Occult Terminators after using Warp Time to allow the Daemon Prince to move again during the psychic phase. The Daemon Prince took a wound from overwatch, but smashed into my Kataphron Destroyers, wiping out the squad. It didn't matter that I lost 1 to supercharge earlier, he would have died along with his two pals. Oh well. My opponent then used a Command Re-roll to make sure his Scarab Occult Terminators got into combat, as well as the Sorcerer in Terminator Armor. He lost about 1 or 2 Scarab Occult Terminators to Overwatch. And then they beat up my poor Kastelan Robots and put the injured one down to 1 health or something. Belisarius performed a Heroic Intervention and killed another 2 Scarab Occult Terminators, and my Kastelan Robots' AP 0 melee attacks did absolutely nothing against the Terminators. I moved my Skitarii Vanguard and Imperial Knight closer, while moving my Tech-priest Dominus and Tech-priest Enginseer back. I repaired the wounded Kastelan Robot up to 4 health or something, I can't remember. Then I fired the neutron lasers into the Chaos Predator and took about 6 wounds or so off it because I was rolling pretty badly. Oh well. My Skitarii Vanguard then shot the Daemon Prince and despite rolling a couple of sixes, only did 2 damage because he made his 3+ armor save. The plasma calivers rolled terribly, despite me re-rolling the gets hot rolls, and only 1 wound made it through for 2 damage. My Knight used his twin Icarus autocannons and reduced the Daemon Prince's health down to 1, and then blew up the Chaos Predator with his rapid-fire battle cannon. Good riddance. And I completely forgot to shoot my Skitarii Rangers' arc rifles into the second Helbrute so stupid mistake there. I then charged my Knight in and stomped the Daemon Prince to death. Belisarius killed another 2 Scarab Occult Terminators while my Kastelan Robots remained completely useless in combat despite me actually getting the Shroudpsalm and re-roll rolls of ones in the fight phase Canticles, and somehow they survived the Terminators' onslaught. But not for long. My opponent continued to move his remaining units up, and began spamming Smite. His Exalted Sorcerer actually periled, rolling double ones, so he spent one Command Point to re-roll that. The recently repaired Kastelan Robot and Belisarius took a few mortal wounds, and the second Kastelan Robot died. The Hellbrute opened fire on the Skitarii Rangers this time and thanks to their cover saves, I managed to save 3 of them. 3 of the Terminators engaged Belisarius in combat and put 4 wounds on him, and combined with the mortal wounds put on him earlier, they actually slew Belisarius. Even the Archmagos of Mars can't take on 10 Terminators by himself, and the Kastelan Robots were piled with more wounds, and I finally lost my third Kastelan Robot. I think. I healed Belisarius with my Tech-priest Dominus while backpedaling my Knight to prevent him from getting charged by the approaching Hellbrute. I also retreated my Onager Dunecrawlers when it seemed clear my Kastelan Robots were all going to die, but at least they tied the Scarab Occult Terminators and Sorcerer in Terminator Armor up for 3 whole turns! Oh, and I got the Canticles Shroudpsalm and +1 Strength. The Onager Dunecrawlers fluffed their shots against the Hellbrute and only did 3 damage. Ouch. 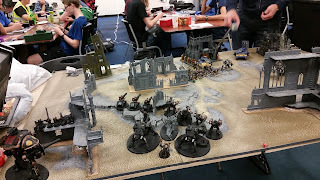 My Skitarii Vanguard fired their radium carbines and failed to kill the Aspiring Sorcerer, while the overcharged plasma calivers succeeded in destroying the Hellbrute. Phew! The arc rifles and remaining galvanic rifle didn't do much against the Exalted Sorcerer. It was my Knight Paladin who killed the Aspiring Sorcerer with his heavy stubbers, and his twin Icarus autocannons actually killed Ahriman before I could even fire the rapid-fire battle cannon at him. What the...I actually rolled 4 fours and dealt 8 damage to poor Ahriman. Guy never gets a break. Even with the extra Strength, my Kastelan Robots did nothing in combat. Instead, my opponent piled more Smite on them and killed the final Kastelan Robot, while his Courier, the Exalted Sorcerer, began wisely fleeing away from my Courier, my Knight Paladin, instead of advancing toward him, and Smite one of the Skitarii Rangers, leaving just the 2 arc rifles left. The Scarab Occult Terminators, free from combat thanks to Smiting that last Kastelan Robot, then open fired and wiped out my Skitarii Vanguard. All 5 of them in one volley. Holy Omnissiah! He then charged up and engaged the Skitarii Rangers in combat and killed one. Meanwhile, the Terminators and the Sorcerer in Terminator armor charged the Onager Dunecrawler and put a couple of wounds on him. 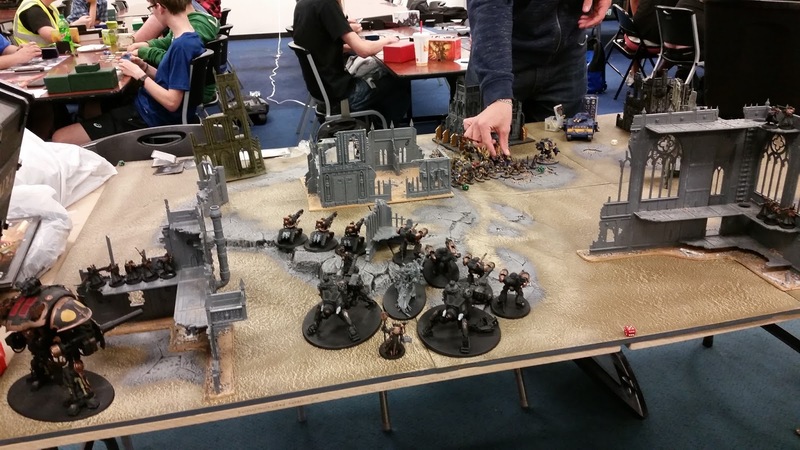 My memories are very fuzzy because I rememebred it was longer, but basically I had my Skitarii Ranger and Onager Dunecrawler fall back, and my second one shot at the Terminators, only to kill one. That wasn't very hot rolling. My Tech-priest Dominus's volkite blaster failed to do anything to the Terminators because of their 2+ armor save. Well, I think this time he managed to deal a mortal wound because I rolled a 6, but...yeah. Terminators have 2 wounds. My Knight Paladin was forced to shoot the Terminators instead of my opponent's Courier because they were the closest target, and I actually killed all the Terminators except the Scarab Occult Sorcerer! I rolled the Canticles re-roll failed Morale tests and re-roll ones of shooting hits, and since I have 6 Command Points left, having only spent one to change the Kastelan Robots' Protocols at the start of the game (by this time my opponent had zero because he spent them all on Command Re-rolls), I used Gloria Mechanicus or whatever that was and spent 2 Command Points to change the useless morale thing (because of the Twist in Open War) to change it to Shroudpsalm. Considering I rolled Shroudpsalm instead of choosing it, I guess it counts, right? And yeah, my writing is pretty haphazard, but obviously the Canticles and all that were done at the beginning of the Battle Round, but I used the Canticle right at the start of my opponent's Shooting Phase to immediately change to Shroudpsalm. Good thing too. The Scarab Occult Sorcerer put a mortal wound on my Tech-priest Dominus with Smite, and then shot and wounded him with 3 Inferno combi-bolter rounds. And what do you know, I rolled 3 3s. At first we thought he was basically dead because of AP -2, but then I remembered Shroudpsalm. YAY! So...he only took one wound. The Scarab Occult Terminator charged the Tech-priest Dominus while the Sorcerer in Terminator Armor charged my poor Onager Dunecrawler, and while my Dunecrawler made his saves, my Tech-priest Dominus took 3 wounds. If I hadn't used Shroudpsalm, he would have been dead. Oh, and the Exalted Sorcerer Smited the last surviving Skitarii Ranger. Oh well. The Tech-priest Dominus didn't manage to kill the Scarab Occult Terminator, though. My Tech-priest Dominus healed 2 wounds, and my Tech-priest Enginseer ran to him to heal another 2 wounds to bring him back to full health. My first Onager Dunecrawler fell back again, only for the second one to fire...and miss all but one of his shots. But that was enough. For it wounded, and the Sorcerer in Terminator Armor failed his save, only to uh, take 3 wounds from the neutron laser. He died. I then fired my Knight Paladin's twin Icarus autocannons and rapid-fire battle cannon at the Exalted Sorcerer and glibbed him...which meant I won the game. And essentially tabled my opponent. Yeah, killing the Exalted Sorcerer earned me the victory, but even if it had continued, I would have charged my Knight into combat and kill the Scarab Occult Sorcerer, who was still locked in combat with my Tech-priest Dominus. Or not, since I moved the Knight far away from the combat so that the Exalted Sorcerer will be closer to him. So never mind. Anyway, that was about it, and with me achieving the Objective's victory condition, that is, slaying my opponent's Courier, and well on my way to tabling him because he had only one model left, it was a great win. It was a very close game, though. Seriously, those Scarab Occult Terminators did some serious damage, tying up my Kastelan Robots, my biggest threat for the majority of the game, and killing them. He also took out all my Troops and infantry, and even assassinated my Warlord, Belisarius Cawl. Funny thing is that my Knight Paladin, my Courier which he was supposed to kill, didn't even take a single wound. At the end of the game, by Turn 5, he still had all twenty-four of his wounds remaining. Honestly, if he had tried to attack my Knight with his Chaos Predator and Terminators instead of my Kastelan Robots, he might have won. Okay, Smite wouldn't have worked because I essentially had my Knight bubble-wrapped with Skitarii infantry and Onager Dunecrawlers and Kastelan Robots, and you can only hit the closest unit with Smite, so...yeah, but twin lascannons? Why not aim that at my Knight instead of my Kastelan Robots? Why not assault my Knight with Scarab Occult Terminators instead of my Kastelan Robots? Well, because if he did that, my Knight would just walk away from combat and my Kastelan Robots would shoot them to death. Maybe. I don't know. In any case, I was left with little over half my army (about 1,039 points worth of a 2,000-point list) while he only had a single Scarab Occult Sorcerer left. But it was a close battle, and I'm glad I managed to win somehow. Knights are awesome! And the new Stratagems and Mars forge world dogma really helped make a difference! Looks like Adeptus Mechanicus is still as strong as ever! Hmm, I wonder if this is basically my 8th Edition version of the Adeptus Mechanicus War Convocation? Funny thing though, I have never won a single game with my Adeptus Mechanicus War Convocation in 7th Edition, while I actually won a game with my Cadian Battlegroup while almost tabling a Tau enemy in 7th Edition. In contrast, my army of Imperial Knights and Adeptus Mechanicus are mostly dominating in 8th Edition with the exception of the extremely skilled Tau player I usually practice against. We'll try a few more games, and I'll go down to Dreamers Vault early on Saturday to practice with my newly designed Adeptus Mechanicus army and hope that last week was a terrible off-day for me because of my cold.